I thought I show you what I have been working on lately. I am fairly busy at the moment, so don’t have that much time to art but I do try to squeeze some art in here and there. 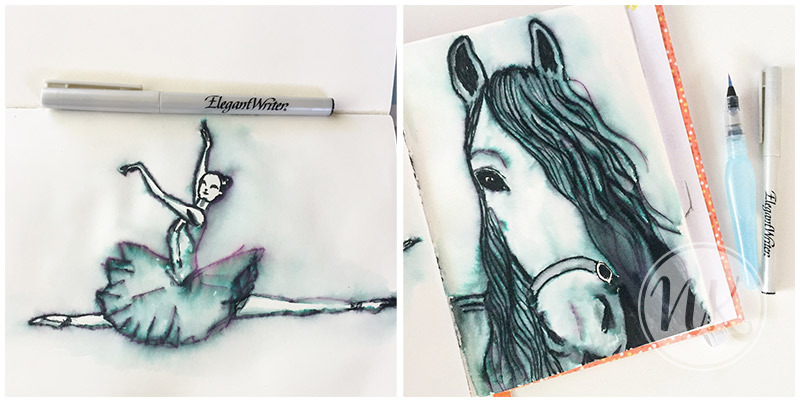 Inktober is in full swing – are you participating? Every October, artists all over the world take on the Inktober drawing challenge by doing one ink drawing a day the entire month – 31 drawings in 31 days. In previous years I have managed to do only one drawing for the entire month. I started out strong the first 9 days and then I fizzled out a bit due to time restrictions. But I will see of I can catch up. If I can – great, if not – that is okay, since I promised myself to not put any pressure on me. It has been a mighty challenge so far since I thought I follow the official prompts. So not only am I limiting myself to just using ink, I am also committing to certain themes and… some are SO out of my comfort zone! On certain days I have sat and stared at a blank page for a long time, not sure what to do! But I pushed myself and I am learning lots of new things. The first prompt was “fast” and I thought, great – I draw a car. Never in my life have I drawn a car – what was I thinking?!? Don’t get me wrong, I love cars, especially good looking, expensive cars! But drawing a car? 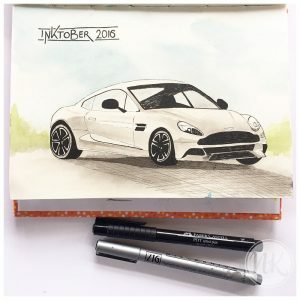 Well, I did it – with quite a few mistakes but hey, I am not claiming to be an expert 😉 By the way, if you want to know what car this is: it is an Aston Martin DB11. 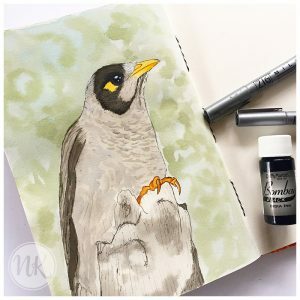 2/31 – noisy: Hubby suggested a Noisy Miner – a native, Australian bird. It has been drawn using black pen and india ink, don’t have many colours but it worked out quite nicely. The first two prompts were on the weekend, the challenge for me was to keep up during the week. I decided to divide half a page in my art journal into 4 squares and 1 rectangle, drawing small to save time. What did I learn from this? I don’t like drawing small, I need to be able to draw in more details. I learned that I still can’t keep it simple, keeping it loose. Something I have to keep working on. The prompts were collect, hungry, sad, hidden and lost. You don’t see it in the picture below, but I completely screwed up the prompt “hidden” at first. 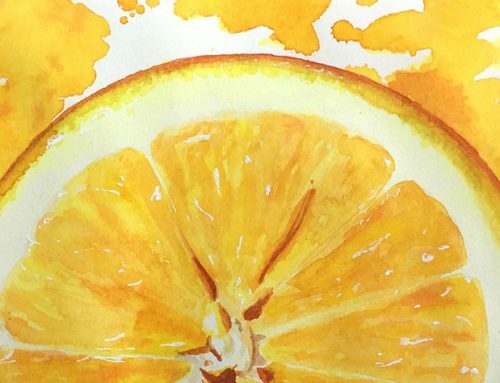 Since it is ink, there is only so much you can do to save it. 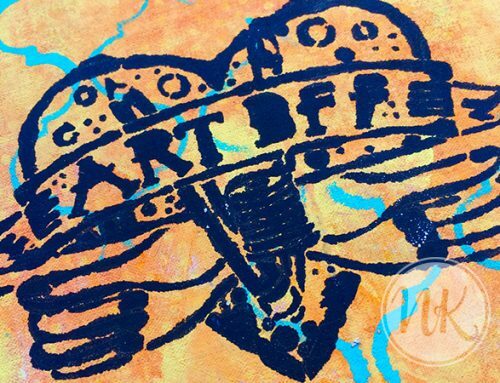 In my case I glued in the new drawing on a separate piece of paper. I was so frustrated but I dealt with it and didn’t give up. My favourite of those 5 drawings is the eye, belonging to the prompt “sad”. And yes, that is because I didn’t have to draw so tiny and could add in details. I used black pens and comic markers for three of the prompts to add some shading. Is it perfect? Naw! But I still like it a lot! “Rock” was the next prompt and boy did I struggle to come up with something for this! Again my hubby came to the rescue and suggested a diamond. 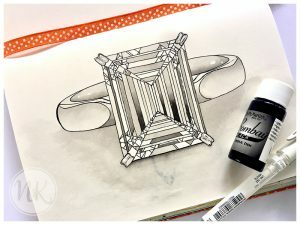 I drew this emerald cut diamond ring and shaded it with india ink, love the structure of this drawing. A little disappointing is the fact that the eye from the previous page is showing through but – it is just my art journal, it is okay. 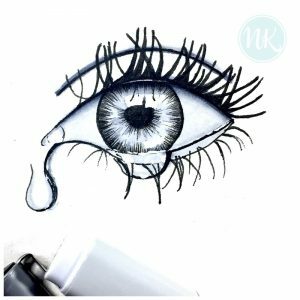 Prompt 9/31 – broken. Again a difficult prompt for me. I didn’t want the typical broken heart, I thought of a broken tea cup or an iPhone with a broken screen but all that didn’t inspire me. 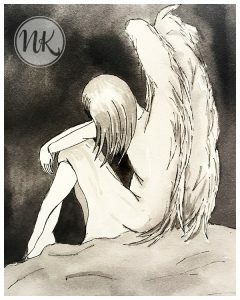 Finally it came to me to draw a broken angel, I kept it simple (as you know very hard for me to do) and I absolutely love how it turned out! During last week I simply had no time to do any drawing and I am trying to catch up with the prompts. I will see how I go 😉 The next prompt is “jump”. My inspiration came from ballet. My daughter has been dancing since she was little and since last year we have been to see many dance productions and we are loving it. It was hard to keep the face simple and to not draw in more details but I know – would I have done that, I would have messed it up. I used the Elegant Writer for this, which reacts to water and creates beautiful colours. Prompt 11/31 was “transport” and immediately my thought was, “heck no, I am not drawing another car!” Haha! My thoughts went to a horse. Only recently have I started horse riding lessons (oh yes, in my age! ), something I dreamt of since I was a little kid. And for as long as I can remember I always was in love with Friesian horses, strong and elegant at the same time. This is only the second time I drew a horse, a subject that I have to practice more. So how are you doing? 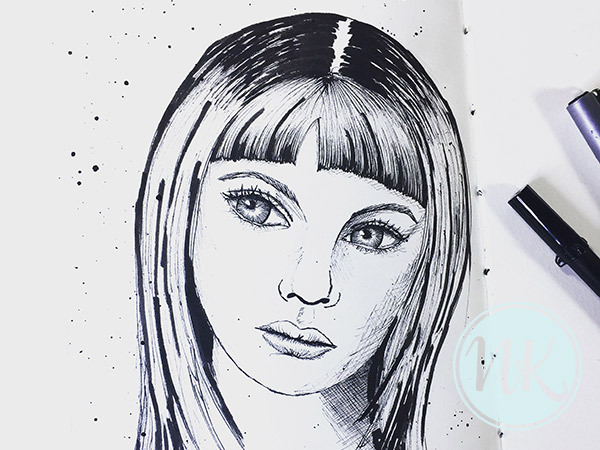 Are you participating in Inktober? 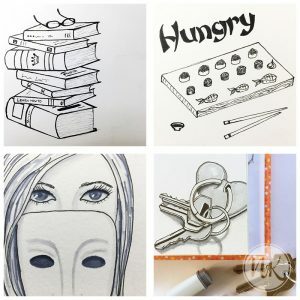 Are you following the prompts or do whatever you feel like?